Biggest Loser Week 17 Recap: Who Just Walks Off?! *SPOILER ALERT* This post reveals details from last night’s The Biggest Loser episode. So if you don’t want to know the dramatic details and results, click away, my friend, click away! Last night’s episode had a lot of hype swirling about it. Like, a lot of hype. But did it live up to it? Yes…and no. Now for where last night’s episode fell a little flat. So little of the trainers! We’re in serious Bob withdrawal. And with Jillian leaving the show after this season? Ah, it hurts! We wish there had at least been an interview with Rulon after the show that either showed how he was doing at home or somewhat explained his throwing his hands up. But, maybe that’ll come next week. We hope. We also hope that next season all of the participants are a little more respectful of the show and the experience they’ve been given. For more on last night’s episode, check out the episode 17 recap video below by Mark Pinhasovich from BL season 10! Can’t see the video? Click here to see The Biggest Loser 11 recap from DietsinReview! Last nights episode was disgracefull! NBC/Biggest Loser should have never allowed Tara to compete for prizes in the challenge. SHE WAS A GUEST AND AN INSPIRATION ONLY! Tara had her time, now it is the current contestants time.Why didn’t they just allow Sam and Ali to compete as well since the show had no intentions of making it about this years players. Here you have an Olympian (and even if he wasn’t)who has worked hard this season to lose weight and gain self esteem to win cash and his/her picture on the Wheaties box as well as be a guest of NASCAR at RIR and it was swept away by a former cry baby, Tara. I have lost all respect for the show and Tara for excepting the prize, afterall if it were her season she would have cried and spoke out and probably given the award.For the show to bring out a photo finish like it was NASCAR, come on people, Rulon, THIS seasons competitor won! The big fellow was shafted! Rulon does not need the Ranch. Rulon Rocks and Tara should have never came back!! Here are just a few great examples that you just don’t have to have that ranch. it’s a lady who took off 100 then did a beauty pageant and was on the Dr. OZ show and in many magazines. dropping processed foods, cutting down on sugar, lifting a few weights. Rulon left because the show asked him to stop breaking the rules. He was still sneaking food and sneaking off to see his wife at night. Also, being that he was a wrestler, he was familiar with using sweat suits during workouts to shed extra water weight, an unhealthy practice he continued to do there on the ranch and teach to the other contestants. The show’s executives asked that he stop doing those thing, and instead of complying with their requests, he basically said “screw this” and left. I don’t expect to see him come back for the show’s final weigh in either. Until there’s evidence that Rulon was kicked off or breaking the rules or asked to leave, or just up and quit, I think I’ll give him the benefit of the doubt. He said his reasons for leaving were personal, and none of us know for sure what that means. We can sit in judgement, say he’s throwing away an opportunity, but what if there really is a serious issue at home? Isn’t that more important? Hey yeah definitely, I’m just puttin that out there. Of course people are going to speculate on what happened but based on what I personally know … those are just my reasons for why I don’t respect him or his decision to leave. I totally agree! Yeah for doing it off the Ranch. He so can! No Tara should have never been up for a prize. Dumb NBC producers. Come on. Maybe we are in for a surprise and this was just some kind of media set up and he will be back for the long hall. I can hope can’t I!! I also think if he really left he would have said goodbye to his friends. This was a set up!! Yes if he is needed at home he needs to be there. Someday the truth will be known for why he left. I thought the show was so stupid last night. I will never buy Cereal with Tart’s photo on it. What were they thinking. My gosh come on! Biggest loser needs to re-boot and think things through. I know he can do it at home and those are some great examples. Thanks for sharing. That’s probably how Rulon felt too. These people have been there all season. The guy didn’t get on Wheaties when he won an Olympic Gold Medal…and some chic who already got beat on the show wins the prize? why would they do that. Glad Rulon walked and went home. He is smart. I do not think we will ever know exactly what happened with Rulon, I think the only thing we can do is wish him the best. It was so silly to have trumped up Tara Back on the show! Tara is a loser for competing for a prize after her turn was over. Kick her off for good BL. Of course we’re not going to see proof that he broke ranch rules, per good ol’ Hollywood gag orders. You tell, you don’t get paid for being on the show. We even saw the food sneaking on an episode!! I heard the same thing, and if you ask me, it’s exactly why you didn’t see an at home update from Rulon, and you most likely won’t see him at the finale either. He was no better than anyone else on that ranch, and doesn’t deserve preferencial treatment. I’m sure TBL wanted him out, and said, we’ll let you go on air and say you wanted to leave, instead of being embarrassed on national television. As far as Kaylee goes… it’s about time. Too little, too late. I’m shocked she stayed on as long as she did. oh… and if he’s ticked about the “prize” from the car thing. the show is supposed to be about changing your life… not cashing in at everything you do. someone on another blog/post said that he was on the show “I Survived..” or something like that, so he’s obviously just a reality tv cash cow. Tara should never been allowed to compete for the prize. She had her turn and the winner should have been one of this years contestants. Rulon should have won. So you all are going to quit watching the show because someone who sneaks off the ranch, makes unauthorized phone calls, and secretly gorges himself in his room at night is beaten at a challenge. News flash: he’s not off the show because he lost to Tara. They are not getting paid to be on the ranch but they would be taken to court if they open their trap of what goes on behind doors. YAAAA! Kaylee is finally gone. She was horrible! Whaaa Whaaa I want to go home. Where do they get these people. I loved that you listed all those amazing people who lost weight off the ranch. The lady taht did the beauty pageant looks insane! How on earth do you go from being a cow to Mrs. Idaho. Also I liked the Amanda’s story! As for Rulon well he did not get paid for being on the biggest loser but he short changed himself because if he did not give up I think he would have won the whole thing. Not sure but hey it does not mean he is out of a job. Tara is a pathological mess. Having to win each and every thing in life. and to Lulu… since when is striving to be the best at everything you do a negative quality?? seriously?? i love her competative spirit!! it’s why she is successful and continues to inspire others. true, i think she shouldn’t have been eligible for the prize, but badmouth her just because she pushes for excellence? that’s just sad. I don’t have a problem with Tara keeping the $5,000 since she said she was planning to use it all for her foundation. But I agree that it is kind of lame that she got the other prizes too. That said, I have disliked Rulon since the beginning of the season. I got the impression that he was a game player who felt entitled to win the show because of his gold medal. I love the Olympics and I’m always psyched when one of our US athletes wins gold, but this is a different competition. I can’t say that I was sorry to see Rulon leave… and him saying that Sam left on his own terms made me wonder if he watched that season. Yes, I agree Sam was a class act – he was one of my favorite Season 9 contestants – but he stuck it out until he was voted off like everyone else, and just said he felt good about where he was and he was okay going home. Anyway, I’m glad Rulon left, and it was past time for Kaylee to go too. Anywho, enough drama, I know I’m not the only one out there who falls more in love with the purple team every episode. Olivia and Hannah are gorgeous and totally inspiring! I love watching everything they do, and I really hope to see them both in the Final Four. Girl power! Jenn, pleeeeeeease feature them in a future FitStars if you can, when this is all over! Love! Watching a world class athlete and incredibly motivating role model like Tara compete again on that car pulling challenge was awesome and having her beat such a sneaking, calculating head case like Rulon was beautiful. Rulon has been manipulating and playing people false since the beginning and I hope it comes out how he REALLY acted while he was on the ranch. Pay attention– just because a person wins a gold medal doesnt mean they have a good attitude or a sense of fairplay. Also, did you notice how Allison gave Kaylee such a tongue-lashing when she had spoken up about wanting to quit the Biggest Loser a few weeks back, but when Rulon steps up and says he’s quitting Allison didnt say one word about it… more evidence that Rulon was being kicked off the show and NOT leaving because he “was close to goal weight”. What a joke. The Biggest Loser finally had to kick him off despite the naive fan base he had gained just for being a former Olympian because they realized if he won it would come out that the results on Biggest Loser had been completely rigged by his unethical, low class tactics. That on top of losing Jillian next season (and possibly Bob in not to much longer too) would have finished off the show’s ratings. It was a big fat fake and it was set up to make rulon quit! Stupid Show!! I am done watching! Rulon is a joke!! He went on the show for the money because his business is failing. Running a fitness center at 500 lbs…give me a break! The show should of never put a professional athlete with the common day person anyhow. He is a great PR person….but you can’t hide your true colors!! Every dog has his day!!!! Guys, the ending of the race was definitely faked. I posted proof at http://blfake.blogspot.com — I don’t know why they did it or how it relates to Rulon leaving, but it’s obvious that they re-shot the ending to make Tara win. 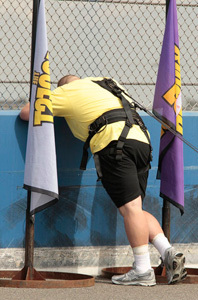 I am watching the biggest loser, and I just wondered why did Rulon left? I imagined him as the biggest loser WINNER! Seriously, when he decided to leave for “personal reasons” was BS! I don’t believe that is the reason why he left. Weeks ago Jillian found out about his junk food habit. It’s clearly he was still not ready to change his eating habits. It’s so sad, that someone that was a olympic gold medalist don’t have his goals straight! It’s sad how he just left! HE WAS SO FAR AWAY!! He was not at the beginning of the show he was near the END! WTF? In my opinion, he got pissed off on his last challenge with tara. I was mad when tara had the opportunity to win the challenge! I mean, this women already HAD HER TURN! It was unfair for the show to even allow that! If Rulon left for that reason, HEY I AM WITH HIM 100%!!! I wish Rulon the best, and I also hope he learns to shut off negative voices. I can’t believe they allowed Tara to compete. Rulon should have won the race. Besides he has lost several toes on one of his feet, I’m sure it made it more difficult for him. After he left, the show was too boring. And then Olivia won, I thought she was mean and nasty the whole time. It was funny to watch Rulon say he was at his “goal weight” with at least another 100 excess pounds hanging from his gut. Even the pictures of him when he was younger, as a wrestler… he may have been in shape underneath all that flab, but he was hugely overweight then, too. He left the show looking how some contestants look when they first start. He was still fat as hell. Greetings from Los angeles! I’m bored to tears at work so I decided to check out your site on my iphone during lunch break. I love the information you present here and can’t wait to take a look when I get home.